In the growing competitive corporate environment, the demand for new innovative products that help drive growth becomes of vital importance. In Businessweek magazineIBM CEO Samuel J. Palmisano was quoted as saying “The way you will thrive in this environment is by innovating – innovating in technologies, innovating in strategies, innovating in business models”. This sentiment is echoed in companies like Google, Nissan, and Apple to name a few. 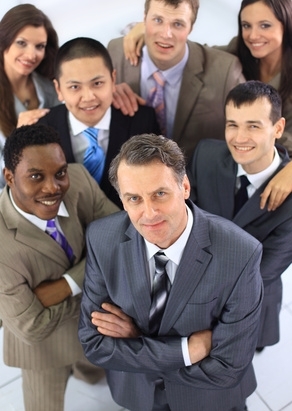 Therefore, to meet this demand it is rather common for most companies to conduct group innovation sessions. 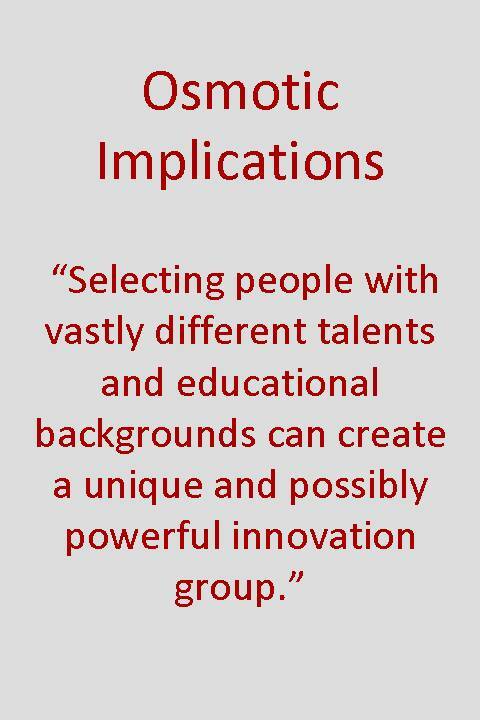 Considering this, the question then is how we can create an effective innovative group? In creating this, one of the most important steps is in choosing the participants. But what kind of person are we exactly looking for? There are numerous personality type tests one can use to either screen job applicants, or better understand the people within an organization. With the demand placed on innovation it is no surprise that 80 percent of fortune 500 companies use some kind of personality test, with Myers-Briggs Type Indicator being most favoured, according to an article in Psychology Today. These tests not only have their pros and cons in the Psychology community, but they can also be expensive and most likely need a professional to administer. Therefore, I propose a more simplistic approach in modelling a group and deciding participants. On the other hand, consider a Theatre company employing a group of interpretive dancers. In this case, one would expect most of them to be somewhere near the “Very Artistic” side and so with a box placed there, our graph would then look a bit like Figure 2. In looking at the differences between the two examples, it can be hypothesized that the nature of a corporation essentially preselects the members of that group and therefore makes obtaining people from different end of the spectrum rather impossible. Therefore, with use of such a model to describe the dominant nature of a group, one can then ask: is it advantageous to select people strictly from within the group, or would it be more valuable for the company to have a sampling from different locations on the graph? Should we primarily select within a particular segment of the spectrum, we know we would get people who share a similar educational background and interest in the field they have a career in. However, although a broad commonality is shared, each one of us is unique and brings to the table a spectrum of emotional and intellectual diversity that in of itself may be sufficient enough to tackle the challenge at hand. Ask the participants about their hobbies outside of work and somehow incorporate that into the session. Discover more about the people in the session and tap into their previous experiences and talents. Using such methods will certainly bring something different to the innovation session, but the facilitator must still be wary of how immersed they are in the challenge. Often times, even with these techniques, it is a bit difficult to get people thinking outside of what they are familiar with. This brings me to the next (and personally preferred) method: inviting people outside the group. In contrast to selecting within the group, we can consider the option to select people from different locations along the plot that exist outside the group. In doing this, a wider array of creativity and alternate viewpoints can be introduced. Think of what would happen if someone like a magician were to attend an innovation session being conducted by an engineering firm. Would doing this successfully contribute anything? If we consider the art of Magic, there is clearly lots of innovation and creativity that goes into any small to large illusion. Therefore, one way to utilize someone like this would be to have them perform a few small tricks. After each one, the engineers would be challenged to try and think of different ways it could have been accomplished. In doing this, the engineers will essentially be solving a rather unique puzzle while getting their minds primed to think in a different way. Have the magician then reveal the trick and allow the group to discuss the different ways they approached an explanation to what they just saw. This is just one example of taking someone near what we termed “Very Artistic” and placing them into the group that may be more near the “Very Structured”. I am sure with a bit of your own creativity you can come up with other examples. With both options discussed, is one technique better than the other? I challenge you to come to your own conclusion, but to those who think something very specific and technical is best solved by a room of PhD’s using complex equations – remember one important thing: Kekule daydreaming about a snake biting its own tail provided the structure for Benzene, which at the time revolutionized the field of Organic Chemistry. This entry was posted in Culture, Ideation, Thinking and tagged ideation, innovation session, people, teams.